The municipiu of Carei (German: Großkarol, Hungarian: Nagykároly) is located west of the administrative district of Satu Mare. Carei was first documented in 1213 under the name of Karul. In the 14th century, Carei belonged to the Károlyi family. In the 16th and 17th century, several raids by the Ottoman army are documented. The Kuruc Wars caused massive destruction in Carei and the surrounding area. After the Peace of Satu Mare, which Count Sándor Károlyi initiated, the count brought settlers from Swabia to the depopulated villages. One of them was Carei, which the repopulation turned into a flourishing town in the 18th century. The economic success also resulted in a demographic development and the number of inhabitants grew steadily. Around 1750, Hungarians, Swabians, Romanians and Jews lived in the region. 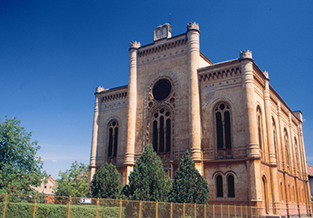 The Károlyis also built the Roman-Catholic church of Carei, as well as a Roman-Catholic school. 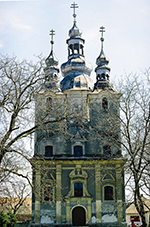 At the same time, the offices of the county administration, a Reformist church as well as a Greek-Catholic church were established in the town. From the 18th century onwards, important guilds were founded in Carei. However, the town only received official city rights in 1848. Carei had to deal with three catastrophes in the 19th century: the earthquake of 1834 and two major fires in 1836 and 1887. The fire of 1887 destroyed almost the entire city and the modern city of Carei emerged from the reconstruction efforts after the great fire. The local transportation infrastructure saw a spectacular development in the second half of the 19th century. In 1871, a railway connection between Satu Mare and Debrecen was established and in 1887, a line connecting Satu Mare and Zalău followed. Both railway lines run though Carei. Many famous figures come from Carei: Gáspár Károli, who first translated the bible into Hungarian, was born in Carai in 1530. A bust in his honour can be found in front of the Reformist church. In the city centre, a statue showing the writer Margit Kaffka, who was also born in Carei, is located as well as a statue of Avram Iancu. He defended the Transylvanian Ore Mountains in the years of revolution in 1848-1849. He is especially admired by the moțis, the original population of the western mountains. The city centre is shaped by the splendorous dendrological park, which covers ten hectares. It was built around the Palace of Count Károlyi in the 19th century and holds hundreds of different groves and tree types. Today’s face of the Károlyi’s main palace was shaped by a reconstruction in 1894. The foundations are from 1794. Today, the palace holds the city museum and library. 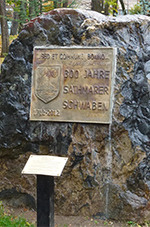 RIGHT: Commemorative plate for Swabians of Satu Mare in the palace garden. 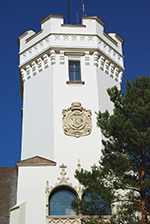 LEFT: The tower of Károlyi Palace. 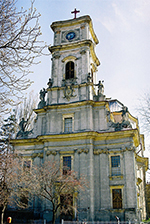 RIGHT: The Roman-Catholic church of Saint Joseph of Calasanz (1769-1779) is known as one of the most beautiful baroque churches in the region of Satu Mare.